It seems to me that it seems to be a commonplace tale around the (online?) Eastern Catholic water cooler which goes something like this. Up until the late 16th Century, Eastern Orthodox living in the area of what is now Ukraine and Belarus were living fine and happy with their perfect Byzantine liturgy, apophatic theology, and mystical spirituality before the big, bad Jesuits stormed in; duped bishops and laity alike; and inaugurated one of the greatest ecclesiastical heists in history, the Union of Brest (followed 50 years later by the Union of Uzhhorod). The inevitable fruits of the “Unia” — so the story goes — was a loss of the “pure Byzantine tradition” coupled with the onset of forced Latinizations. Without getting into the messy history surrounding Brest (which, I should add, was not orchestrated by the Jesuits nor aimed at destroying the Byzantine Rite), I wish so many of these contemporary naysayers of the “Unia” who love to spend their free-time disparaging Latin devotions which they seem to know very little about would spend a few minutes with Fr. Peter Galadza’s excellent study, “Seventeenth-Century Liturgicons of the Kievan Metropolia and Several Lessons for Today,” 56 St. Vladimir’s Theological Quarterly 73 (2012). In an earlier post, “The Ways of Greek Catholicism in the West – Liturgy,” I discussed Fr. Galadza’s article in some detail, highlighting in particular the messy business of trying to restore certain Eastern liturgical practices after they had fallen out of memory. Another important lesson from this study — one which I didn’t focus on previously — is the fact that it took nearly a century after Brest for what some might call “liturgical deformation” to set in — a deformation inspired in no small part by the limited educational opportunities available to Eastern Catholic clergy coupled with the rise of the Basilian Order which, at the outset at least, was comprised of a significant number of Polish clergy whose knowledge of Church Slavonic was sorely lacking. There then followed some regrettable centuries where the “Uniates” were treated as second-class Catholics by their Latin brethren and subjected to forced conversion at the hands of the Russian Empire (a practice that would be repeated under the Soviets in 1946). By the 19th and 20th centuries, however, the “Uniates” (now properly referred to as Greek Catholics) began a process of self-renewal in Galicia (western Ukraine), including reforming their liturgical practices in order to better reflect the form of the Byzantine Rite their forebears were familiar with. Was this a smooth and steady process? No. Political concerns during the time prompted certain suspicions towards those clergy who favored celebrating “like the Orthodox.” Moreover, many Greek Catholics had, by that point, grown accustomed to their “Latinized” rite; they weren’t interested in liturgical revisions which would make them feel less Catholic. It is terribly easy to sit back today and scoff at such attitudes, as if the vast majority of Christians who have ever lived had ready-at-hand access to books, articles, and websites detailing the complexities of history and the numerous accidents that have occurred in the life of the Church (including her liturgical development). What is despicable about some of these ongoing discussions over a period of time which few today have any recollection of is their failure to account for the popular piety of the people who spent their whole lives immersed in an environment shaped (albeit haphazardly) by Western and Eastern ecclesiastical sensibilities. All of this has sadly given birth to a triumphalist myth whereby certain Eastern Catholics (or, really, Latin Catholics who stumbled onto Eastern Catholicism) proclaim their obvious superiority over those who have gone before simply because a century ago Greek Catholics prayed the Rosary rather than chased “uncreated light” with prayer ropes purchased off Mt. Athos. Distressingly little attention is paid to the reality that when Brest was consummated, the liturgical ethos of these reunified Catholics well reflected that of their estranged Orthodox brethren and that there is something admirable, indeed beautiful, about the fact that despite numerous obstacles, persecutions, and other hardships, these Eastern Christians found the road to Salvation. Even if we are now at a time when “Latinizations” are no longer taken a sign of Catholicity and our historical horizon has broadened far enough to recognize the Greek no less than the Latin tradition as part of the universal Church’s patrimony, there is no virtue in promoting the myth of a backwards and detestable past for the “Unia.” How much better we would all be if instead of sitting in judgment of past missteps, we find inspiration from the perseverance of our Greek-Catholic ancestors and the spirit of unity they fought so hard to preserve. Recently, Metropolitan Hilarion (Alfeyev) of the Russian Orthodox Church gave an interview in which he discussed, inter alia, worship in the Orthodox Church as compared to other traditions. (You can find the interview at the bottom of Robert Moynihan’s Inside the Vatican Letter #49 here.) Here’s an excerpt. Unsurprisingly, my comments on the Feast of St. Joseph the Worker generated a bit of disagreement, both on this blog and other social-media outlets. Fine. Reasonable persons can disagree. What continues to baffle me, however, is what I call the Domino-effect Thesis where a moment of legitimate liturgical change — prudent or not — sets off a causal chain “culminating” in the Novus Ordo Missae and its subsequent fallout. The problem with this thesis is that nobody seems to agree when the first domino fell. Was it in 1960/62 with Pope John XXIII’s simplification/abbreviation of the Breviarium Romanum and certain rubrics for Mass? Was it the mid-1950s top-down revision of Holy Week and the reduction of Octaves on the Roman Calendar? Was it the “Bea Psalter”? Or was it Pope St. Pius X’s radical reorganization of the breviary Psalter in 1911? There are even those who posit that the re-codification of the Mass and Divine Office at Trent planted the seeds of today’s liturgical crisis in the Latin Church. That position, as far as I understand it, is rooted in the belief that liturgical development (change) should always be, on some level, “organic” and that the “imposition” of liturgical changes from the papal office onto the Church as a whole represented a revolution which continues on to the present day. Top-down liturgical reform is nothing new to the Church of Christ, East or West. What is new is the modern capacity to track these changes and critically evaluated them using a deep toolbox of historical, theological, and liturgical learning. This strikes me as a far sturdier approach to addressing contemporary liturgical problems in the Church rather than relying on some meta-narrative of historically inevitable decline which claims to pinpoint accurately the absolute moment when things liturgical started to roll downhill. It also relieves those concerned about liturgy from the psychic-emotional burden of buying into any number of conspiracy theories about the thoughts and intentions behind the various liturgical reforms instituted over the last century. This is not to say that certain reformers didn’t bring highly questionable ideological agendas to the table when they proposed this-or-that change to the Roman Rite. But many of the reforms, imprudent and clumsy as they were, emerged from legitimate pastoral concerns that shouldn’t be passed over lightly. Whether or not those inclined toward hysteria over the “1962 books” will ever bother to take this into account remains to be seen. Now, none of this is to say that St. Joseph the Worker should stay on the (traditional) liturgical calendar. But it is a bit queer that the author of Benedicamus Domino should exhaust so much energy fretting over the loss of the Solemnity of St. Joseph, a feast often cast as “universal” and yet has no analogue in the Christian East. 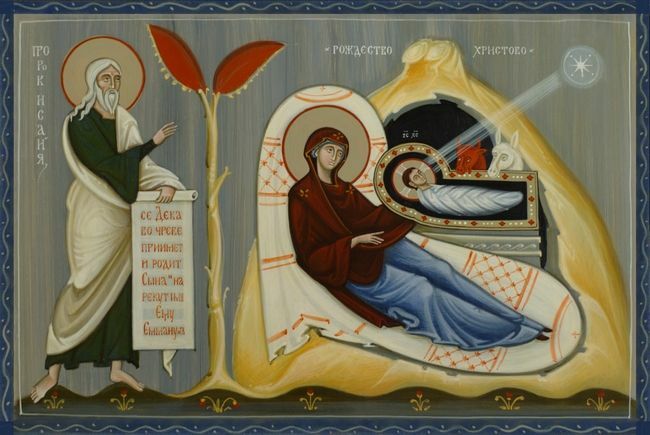 In fact, the only direct liturgical commemoration of St. Joseph in the Byzantine Rite falls on the Sunday after the Nativity and is dedicated to Christ’s forefathers generally rather than St. Joseph specifically. Again, this is not to say that the Latins cannot or should not directly commemorate St. Joseph, but his traditional Latin feast day — March 19 — remains firmly on the books. The Solemnity of St. Joseph, on the other hand, was a 19th C. addition to the Roman Calendar introduced by papal fiat. Its roots run hardly any deeper than those of St. Joseph the Worker. At the end of the day, how much does any of this matter? The arguably needless addition of the Feast of St. Joseph the Worker pales in comparison to the revolutionary changes introduced into the Roman Rite in 1969. Heck, it even pales in comparison to the wreckovation of Latin Holy Week in the 1950s. Even so, the process of restoring the Roman Rite will be a long and hard one, requiring calm, concerted action by Catholic traditionalists, not wild condemnations of comparatively trivial matters. As anyone with a firm sense of liturgical history (East or West) well knows, feasts come and go through the centuries; ordos are revamped; and calendars shuffled about. Sometimes these changes are organic, though both Western and Eastern Christendom’s respective histories testify to numerous top-down changes which left the faithful wanting. It would come as no surprise to yours truly if, in a century from now, the Feast of St. Joseph the Worker became a thing of memory, clearing the way for the celebration of Francis the Merciful.